Source of the Arveyron, Glacier des Bois. Alpine landscape showing rocks, ice sheets, a jagged glacier and spiky mountain peaks as a stream in the foreground flows toward the viewer. 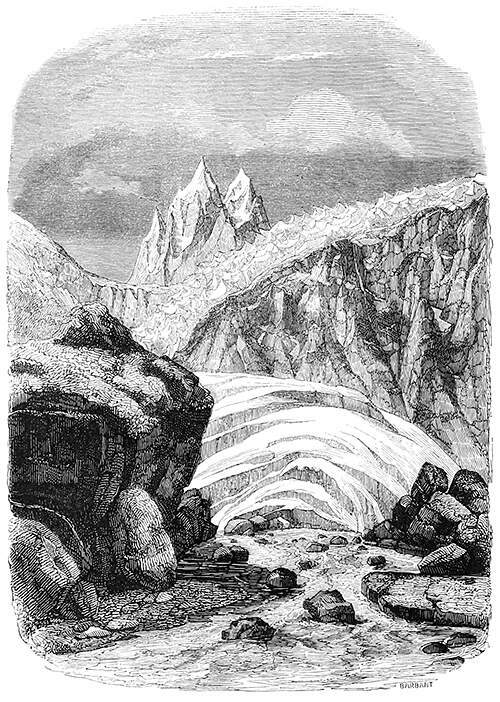 The caption reads in the original French: Source de l’Arveyron, glacier des Bois. 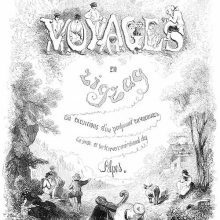 This illustration was originally sketched by Rodolphe Töpffer around 1832 and later re-drawn on wood by Sigismond Himely. 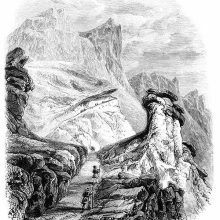 This workflow is typical of most of the illustrations for this book, with other artists specialized in landscape drawing, such as Karl Girardet or Charles-François Daubigny also contributing. 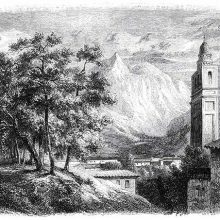 Töpffer’s failing eyesight made it necessary, as it didn’t allow him at this time to go through the more detailed and minute work of making a woodblock ready for engraving.